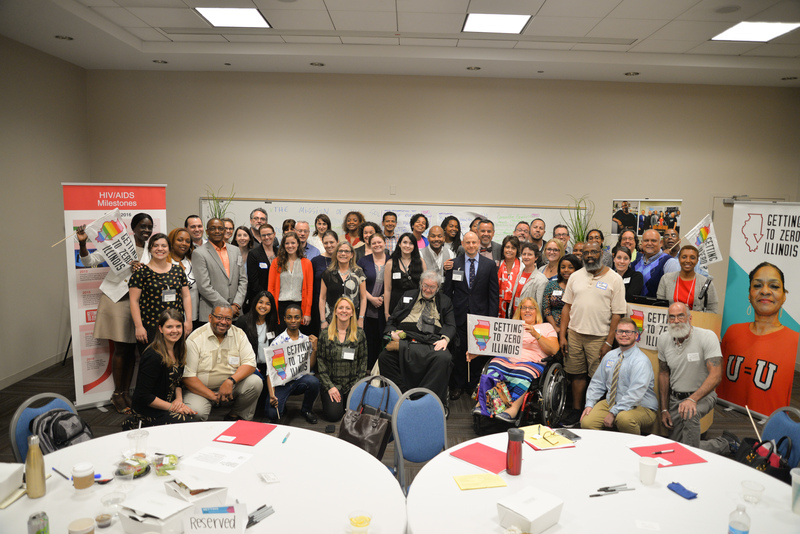 More than 90 people from across Illinois came together at this summit to learn about the state of HIV in Illinois, gather ideas from leading HIV experts across the nation, and connect about how to create this plan to move Illinois forward. Morning speakers included an array of public health officials, including Dr. Nirav Shah, Director, Illinois Department of Public Health; Dr. Julie Morita, Commissioner, Chicago Department of Public Health; and John Peller, President/CEO, AIDS Foundation of Chicago. A presentation by Greg Millett, Vice President and Director of Public Policy at amfAR, brought Illinois’ work to end new HIV transmissions into the context of the national landscape. A rallying call to action from Illinois State Representative Camille Lilly, 78th District, inspired attendees over lunch. In the afternoon, four working committees gathered to meet and collaborate on steps to end new HIV transmissions in Chicago. The Social Determinants of Health, Research, Evaluation and Data, Health Care Access and Housing committees represent community members and public health officials from across the state; at the June 20 summit, they convened for the first time to hear one another’s perspectives and chart the course for building the Getting to Zero IL plan. Stay tuned on GTZ-IL’s blog for updates and perspectives from members of these communities!